The Global Volcanism Program has no activity reports for Emuruangogolak. The Global Volcanism Program has no Weekly Reports available for Emuruangogolak. The Global Volcanism Program has no Bulletin Reports available for Emuruangogolak. The broad Emuruangogolak shield volcano is situated at a narrow constriction in the Gregory Rift and almost completely straddles it. A 5 x 3.5 km summit caldera formed about 38,000 years ago. Since then trachytic and basaltic lava flows were erupted on the northern and southern flanks and within the caldera. A NNE-SSW-trending chain of lake-filled basaltic maars extends along the floor of the rift from the lower flanks of the volcano. Young lava flows were also erupted from vents along rift valley faults. Well-preserved parasitic cones erupted along rift-parallel faults cutting the volcano abound; the latest eruption produced a trachytic lava flow dated from secular magnetic variation measurements at about the beginning of the 20th century. Fumarolic activity and hot steaming ground occurs along NNE-trending fissures within the caldera and along the lower NW flanks. Skinner N J, Iles W, Brock A, 1975. The recent secular variation of declination and inclination in Kenya. Earth Planet Sci Lett, 25: 338-346. Weaver S D, 1976-77. The Quaternary caldera volcano Emuruangogolak, Kenya Rift, and the petrology of a bimodal ferrobasalt pantelleritic trachyte association. Bull Volcanol, 40: 209-230. There is no Deformation History data available for Emuruangogolak. There is no Emissions History data available for Emuruangogolak. 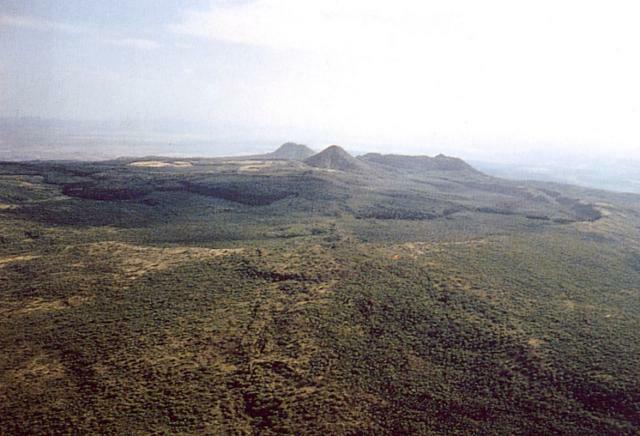 The broad Emuruangogolak shield volcano is situated at a narrow constriction in the East African Rift. The volcano is capped by a 5 x 3.5 km wide summit caldera, whose southern rim cuts across the center of the photo. The trachytic lava cone of Emuruepoli and its associated dome on the east are visible on the northern rim of the caldera. Since formation of the caldera about 38,000 years ago, trachytic and basaltic lava flows were erupted within the caldera and on the volcano's flanks; the latest eruption occurred less than a hundred years ago. There are no samples for Emuruangogolak in the Smithsonian's NMNH Department of Mineral Sciences Rock and Ore collection. Large Eruptions of Emuruangogolak Information about large Quaternary eruptions (VEI >= 4) is cataloged in the Large Magnitude Explosive Volcanic Eruptions (LaMEVE) database of the Volcano Global Risk Identification and Analysis Project (VOGRIPA).